Code Development - Code is developed using an Agile Model and committed to the Repository. Continuous Integration (CI) - The CI Server builds the release. Code Deployment - The Build is deployment to the Test Cluster. Build Validation - The Build is validated by Continuous Validation (CV) and Executed Protocols are posted for QA Review. QA Review - QA reviews the executed protocol and approves the results. Summary Report - A Summary Report is automatically generated that captures all the steps in the Pipeline with detailed evidences. Deployment to Production - This activity can be scheduled and managed by the Deployment Team. The source code was managed using a Git Repo. The first step in the pipeline was setup to monitor the Repo and would execute when a commit was made. The pipeline automatically retrieved the source code package and sent it to the Jenkins Continuous Integration Server. The Jenkins server was setup to build the deployment package and deliver it to the Pipeline. The Pipeline was setup to create a Test (Validation) Session in xLM and this session in turn was setup to launch the xLM Test Automation Model. The Model would run all the required tests (IQ, OQ, UAT) and generate an Execution Report. The Pipeline was setup to stop execution until the QA reviewed the test results and approved it. The Pipeline was setup to create a Summary Report Session in xLM and this session in turn was setup to launch the xLM Report Automation Model. The Model would automatically capture all the evidence required to generate the Pipeline Validation Summary Report. vCD (Validated Continuous Delivery) is a reality. The DevOps model can be successfully adopted to continuously deliver GxP Apps. The above Six Step Model provides the framework along with the toolset to implement "continuous validation" in the enterprise. Such a model will not only compress deployment timelines but will increase compliance using automation and reduces cost significantly. The Fine Print  - The above presentation of the use case is a simplified version for illustration purposes. 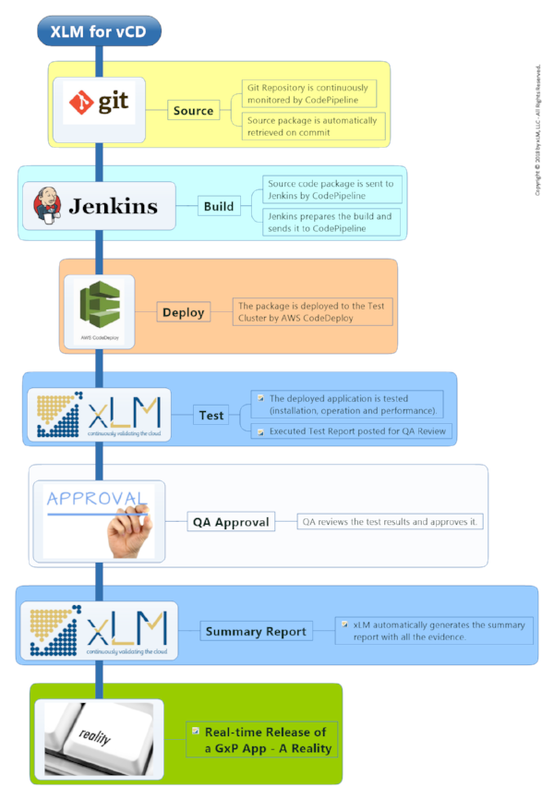 This use case does not include other steps like planning, requirements, traceability, etc..   xLM can setup end to end DevOps Framework for your environments (Agile, Hybrid, Waterfall) that includes all the SDLC steps for GxP Apps including IaaS / PaaS Qualifications.